While most XC race bikes are getting slacker and more trail worthy, Orbea’s latest remains a purebred XC whippet. As XC race courses have grown more technical, most manufacturers have responded by slackening geometries and increasing frame travel. While these changes have helped from a descending and endurance perspective, many purists lament the effect they’ve had on raw speed. 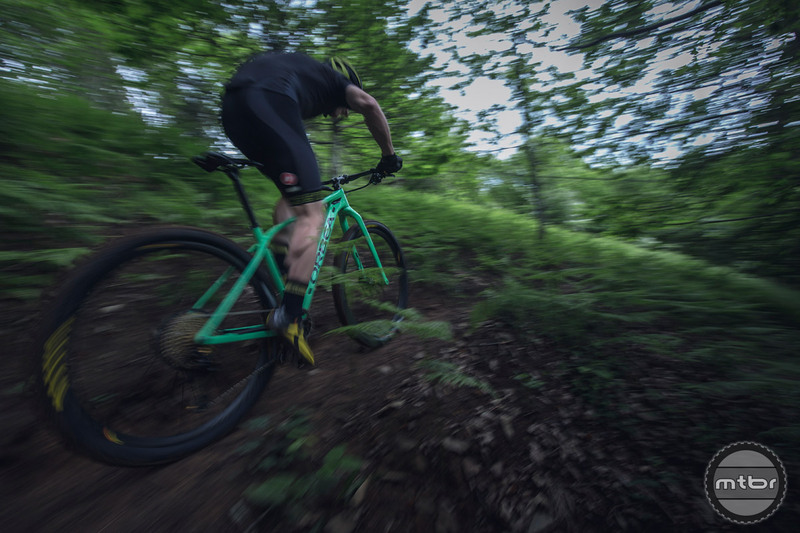 Rather than following these trends, Orbea’s latest crop of XC race bikes continues to be thoroughbred race machines. While they have made some minor concessions for improved handling, their focus remains on all out speed. The new Alma is lighter, stiffer, and more capable than ever before. Their newest bike, which embraces this philosophy wholeheartedly, is the Alma. 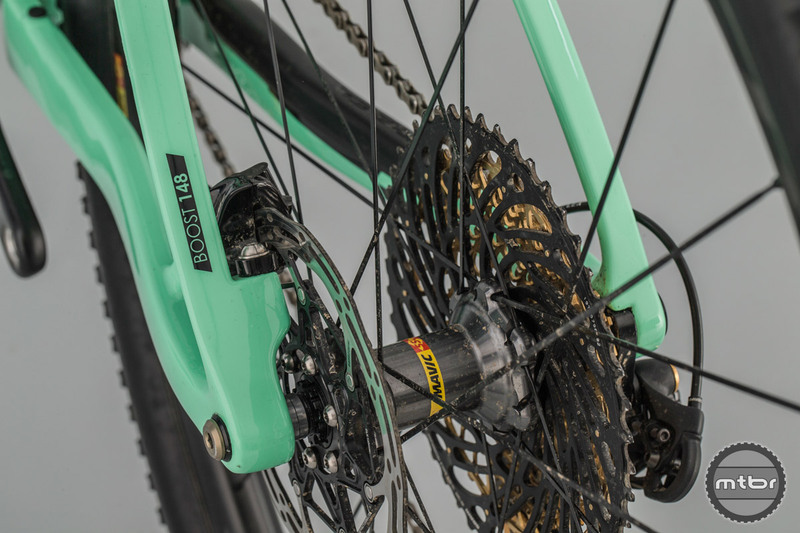 The frame of this fully rigid race bike weighs 950g in race trim. 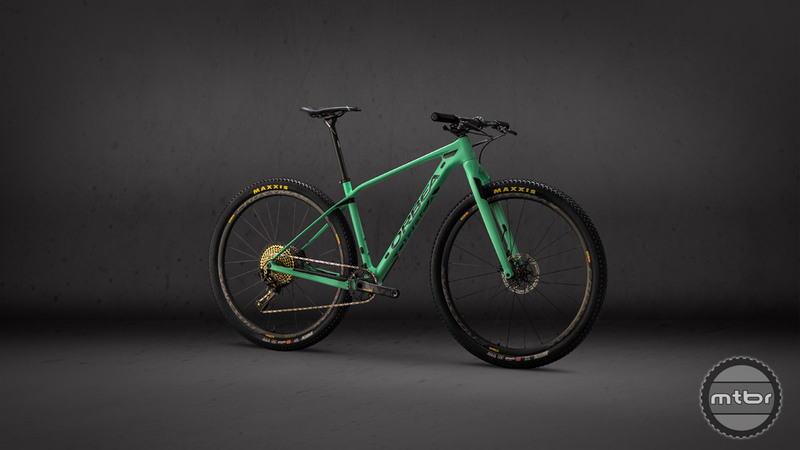 It’s claimed to be 25% stiffer and 10% more compliant than the previous version and ships with an all new carbon fork that hits the scales at 575 g.
The biggest changes from a geometry perspective include a slacker head tube angle, steeper seat angle, lower stack height and BB, and shorter chainstays. The head tube now sits at 69.3/69.5 degrees, which is over one degree slacker than previously, yet is still one of the steepest in the class. The stack has been reduced by up to 11mm depending on frame size and the stays have shrunk by 10mm. Switching from a 135QR to Boost 148 spacing helped Orbea stiffen up the rear triangle, shorten the stays, and improve tire clearance. Orbea was able to reduce the chainstay length by increasing the axle spacing from 135mm to the new Boost 148mm standard. This also improved tire clearance from 2.25” to 2.4” and increased rear end stiffness by a claimed 15%. I mean, really. What is the point of all these hardtails? None of them bring anything to the table at all. Maybe some elastomer in the seat tube. Geez. Such a bore, such a lack of technical challenge and imagination. Everyone, eventually, cannot ride these bikes after the back punishment. @Perfectbike… You’ll get it someday. Frames will be available with or without the Spirit rigid fork. Just go to your local dealer and inquire. More space for wider tires means wider rims which means more volume and less psi for a softer ride with more sidewall support and traction. So more performance and less punishment. All these hardtails make heavy expensive full sus bikes less a comfort or performance necessity. That’s why they’re selling. But this bike doesn’t go far enough to fit Plus width at the rear like a Pivot Les, Spec carbon Fuse or new Giant carbon XCT. Sales might not be up that much for this version. Perfect for the conditions shown on video. Where I ride, that’s about 50% of the terrain, the other 50% you’ll get destroyed. But, I can see where they could start using brand new technology. Maybe a small style polymer between fork and frame meet up. Same with rear just for some ‘absorption’. Nice. I like it. And hopefully it’s 1x. The only change I would make is to add a 2.8 inch tire up front on a 35mm or 40mm rim. Dunno bout you guys, i made the experiment of fitting a 3T carbon rigid fork on a BMC carbon teamelite and boom: this thing flies like a f%$#king rocket. Precise steering, instant acceleration, unimaginable weight savings, simplicity and the like. OK it is not for the rough stuff or for downhill but i easily erase guys with multi thousand dollar full sus bikes on the uphill. For guys keen on climbing like me, it is a no brainer if one wants to enjoy every last bit of the bloody thing.